1: The Vetch Field opened in 1912. Swansea Town (later to be renamed Swansea City) played there from their inception. The site became available when it was deemed surplus to requirements by the Swansea Gaslight Company. 2: The name 'Vetch' came from a type of legume (plant) that orginally grew on the site, though for many years there was a myth in south Wales that it was named after a type of cabbage. 3: The first game at the ground came on Saturday 7th September 1912 and was a local derby against Cardiff City. The game ended in a 1-1 draw and would go on to develop into a fierce local rivalry over the years - with the clubs hating each other even more than they hate the English! 4: The record attendance at the Vetch Field came on the 17th February 1968 when 32,796 turned up for the Swansea Town v Arsenal FA Cup 4th Round tie. 5: In terms of league position, Swansea City's most successful season at the Vetch came in the 1981/82 season when they finished 6th in the old 1st Division. It was remarkabke progress given that they were in the basement division of the football league just 4 years earlier. 6: Swansea Town reached 2 FA Cup semi-finals whilst playing at the Vetch - losing to Bolton Wanderers in 1926 and Preston North End in 1964. 7: The Vetch Field was paid tribute to musically in the March of 1979. During the game against Watford, local fan Roger Evans sang 'Take Me To The Vetch Field' on the pitch and despite initial apathy it has become a cult classic after selling well as a single. It's certainly a 'guilty pleasure' of mine and one of my favourite football songs. 8: Other uses for the ground included a much venue with Stevie Wonder and The Who playing there as well as a Rugby League stadium for 6 Wales games and 2 neutral matches. 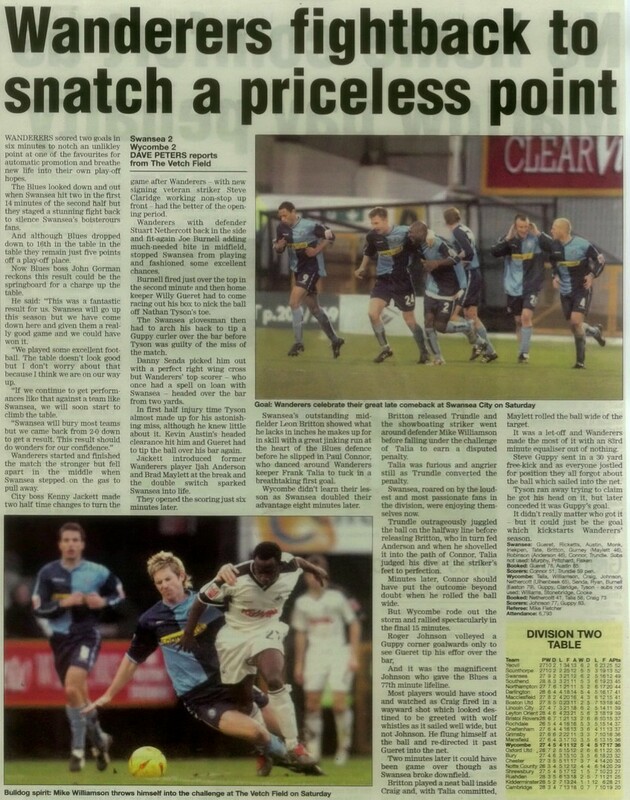 9: The last ever game at the Vetch was the 2-1 victory over Wrexham in the FAW Premier Cup Final on 11th May 2005. Andy Robinson got the last ever goal at the venue with a 75th-minute winner. 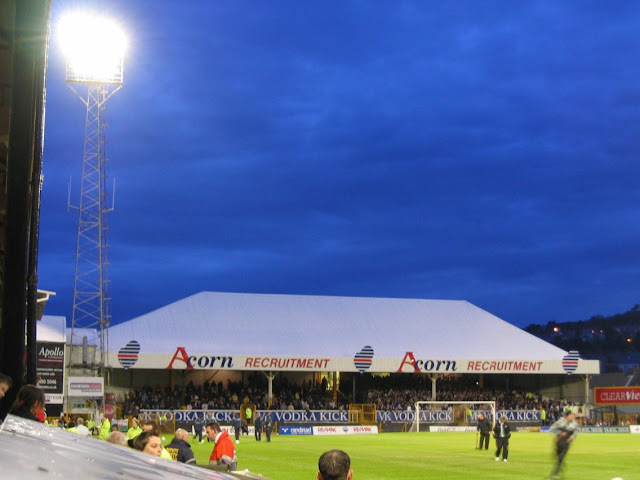 10: Though the ground was last used in 2005, it stood derelict until 2011. The site was used temporarily as an allotment though there were plans put in place to transform it into a community orchard with the centre circle of the pitch remaining in place. My first visit to the Vetch Field was just 2 days after our FA Cup Semi Final game against Liverpool. Whereas 19500 fans made their way to Villa Park for our big day, the total that made the trip to South Wales was around 40. I'd made my way up on the supporters coach, as nobody I knew at that time wanted to go and so it would have cost me too much in petrol. Wycombe started the game well, going ahead after just 2 minutes through midfielder Michael Simpson. Wycombe then went on to dominate the first half and could have had many more goals. The second half was a bit more quiet but Swansea still didn't threaten until 15 minutes from time. 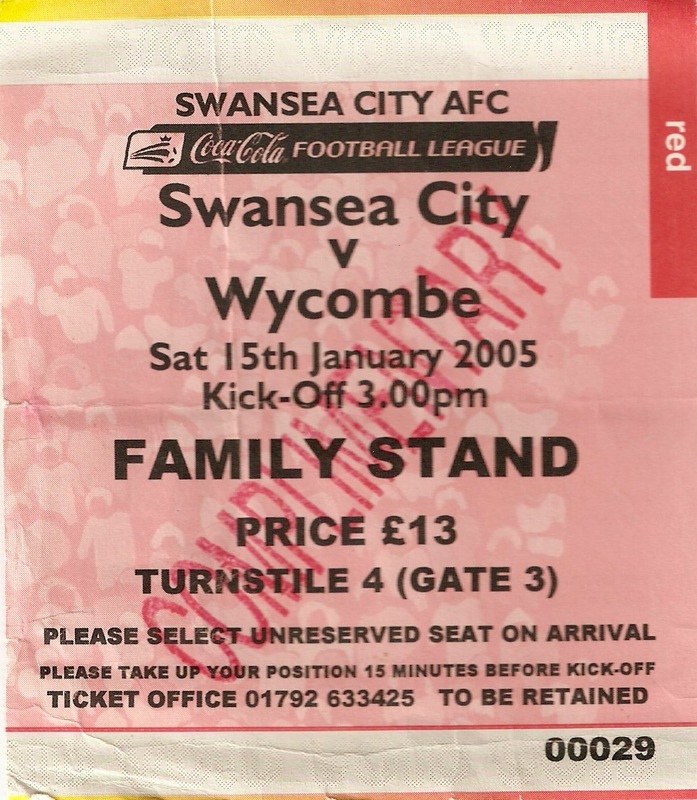 Then as Wycombe had players up for a corner looking for a vital second goal, Swansea broke and scored through Walter Boyd with their first real chance of the game. Wycombe had the chance to go back ahead on 83 minutes after a goalmouth scramble but nothing came of it. So after dominating the game and a draw being a disappointing result, things got worse on 87 minutes when Jason Price scored with a long range shot. With Wycombe looking for an equaliser, Walter Boyd scored a great last minute goal to confirm Swansea's first home win of 2001. 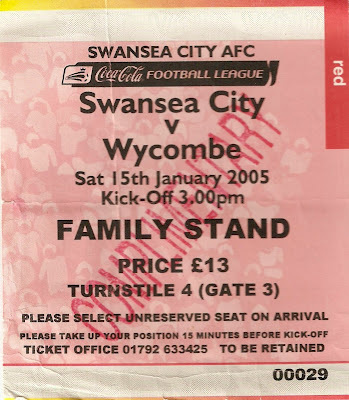 My second visit to Swansea saw a bit of a role reversal from the previous game with both sides having been relegated to League 2 in the ensuing years. But this time Swansea were in the automatic promotion hunt, while Wycombe were occupying a lower mid-table berth. Once again it was the supporters coach that provided my transport, though this time the support was slightly better with 173 Chairboys making the trip to South Wales. Pre-match entertainment included seeing ladies man 'Salmon' flirt with a local girl who was collecting for charity and having rissoles at the chippy even though I hadn't a clue what they were. They turned out to be very tasty though. The match turned out to be an excellent away point for Wycombe, given their patch form in the earlier games that season. Wycombe had the better of the first half but looked to be doomed when a quickfire double at the start of the second half put Swansea in command. A jinking run from Paul Connor and a penalty from Lee Trundle did the damage, but Wycombe contrived to fight back. They had to wait until the last 15 minutes though as a diving header from Roger Johnson and a Steve Guppy free kick gave them an unlikely point after lots of Swansea pressure between the goals. In the end we could have nicked it, but in any case it was a great comeback from 2 goals down. 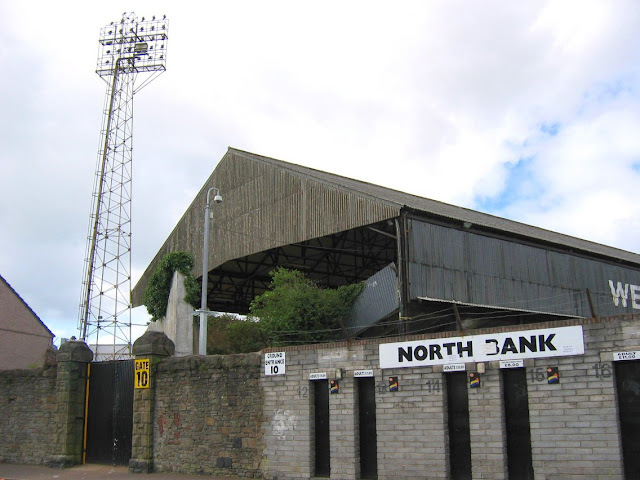 The VETCH FIELD was Swansea's much-loved home before they moved to the Liberty Stadium. And to be honest, despite being in a right grotty location, near Swansea Prison (though there was a good chippy nearby) it was a charming ground. The natives were not the friendliest at Swansea, the local pub we went past was full of Welshmen staring aggressively out of the window, their gaze fixed on any visiting fans. So I decided to give a pint a miss that day!. The location was pretty decent when I look back and I wish I'd taken the time to take the short stroll into the city centre to have a look around. Directly opposite the away end was the most interesting stand. With a small terrace below and a big seated area up above, this stand also has some good looking floodlights behind it. It was a very attractive stand to look at and must have offered a great view from its upper tier. The floodlight also looked great and was pretty unique in its design. The North Bank was to the left of the away end and this was where the main vocal support for the Swans came from. This was the biggest of the stands in terms of capacity and was referenced in the club's song 'Take Me To The Vetch Field' by Roger Evans. Completing the accommodation for the home fans was the South Stand which was another nicely designed seated stand holding around 1,500 supporters. A few hundred seats were given over to the away support for those who did not wish to stand. Finally, the Away End was officially known as The West Terrace and held 2000 fans. At one point there were fences obstructing your view but by the time of my visit they had been removed. I have sourced a picture from an online search to show this as I didn't get a shot of it when I visited.